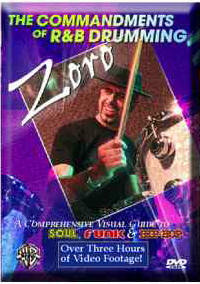 Zoro's R&B DVD is divided into three major chapters, each covering one of the distinct eras: Soul, Funk, and Hip-Hop. Each chapter opens with an introduction by Russ Miller, a well-known drummer and author whose own video and book/CD combination I have previously reviewed (See Drum Set Crash Course in the sidebar). Each video concludes with a song and a brief drum solo by Zoro. All videos consist of Zoro seated at his drum set as Russ Miller prompts him with questions, interview style. Zoro's beginnings as a DJ shows in his vast knowledge of songs from the R&B era. In this volume, he traces Soul R&B drumming from Gospel to Blues to the New Orleans Sound to Detroit's Motown. Along the way Zoro informs us of each landmark song and the drummer behind the beat. Chris Columbo, Bernard Purdie (one of my personal favorites), Nat Kendrick, Al Jackson Jr., Roger Hawkins, Earl Palmer, all the greats from the Soul era are given proper respect. This is the kind of information that makes this DVD of such great interest not only to drummers but anyone interested in the history of R&B music. Zoro intersperses historical info on the evolution of Soul along with actual musical examples of classic R&B songs played by Zoro and an all-star band. In addition, Zoro discusses and demonstrates some of the finer aspects of what it takes to become an effective Soul drummer. You'll learn the importance of touch and sensitivity, how the pros apply ghost notes, the "Train" groove, Buzz strokes, how to master the shuffle (including a rare "lost" shuffle), and more. The second chapter covers the Funk era and is structured exactly like the first. From James Brown through the Disco era, Zoro includes the greatest hits and the drummers who put the Funk in Funky, including: James Gadson, Clyde Stubblefield, John "Jab'O" Starks, David Garibaldi (another favorite of mine), Steve Ferrone, Harvey Mason, Ed Greene, Beryl Young, Tony Thomson, Robert Johnson, Freddie White, Steve Gadd (another fav), Earl Young, and others. Zoro intersperses historical info on the major songs and drummers of the era along with actual performances of classic hits. You'll also learn what makes up Funk and, as Zoro defines it, anti-Funk, how to play unison eighth-notes, Zoro's favorite Hi-Hat licks, and more. The third chapter covers the Hip-Hop era. Repeating the format of the first two chapters, Zoro explains the beginnings of Hip-Hop from Rap through the Go-Go style to New Jack Swing and into the urban sound of today. He takes us through early Hip-Hop, when DJs created drum loops using two turntables, up to the modern day where extensive use of programmable drum machines is made  putting more than a few "live" drummers out of work! As far as the instructional portion goes, you'll learn why you should be able to emulate a drum machine, how to approach playing with a click track, how to apply right hand swing patterns to your kick drum, Zoro's favorite Hi-Hat triplets, some challenging 16th - 32nd - 64th note kick drum patterns, and more. The bottom line is that the instructional material, historical info, and remakes of the classic tunes - exceptionally well done with Zoro on the skins backed by an all-star band that includes Russ Miller on percussion, Al Mackay on Guitar, Donn Wyatt on Keyboards and Kevin Wyatt on Bass - are highly recommended for any drummer and any fan of R&B music in general. And because the companion book/CD contains so many valuable exercises and other information not on the DVD, I highly recommend it along with DVD.